Lugia in game: 1,111 Who? Important notice! Pokemon Lugia is a fictional character of humans. Lugia is a large Pokémon that resembles a dragon, a plesiosaur, and a bird. It is primarily pale silver-white, but it has blue undersides with slightly varying tones. It has a ridged mouth similar to a beak, although it has pointed teeth on its lower jaw. 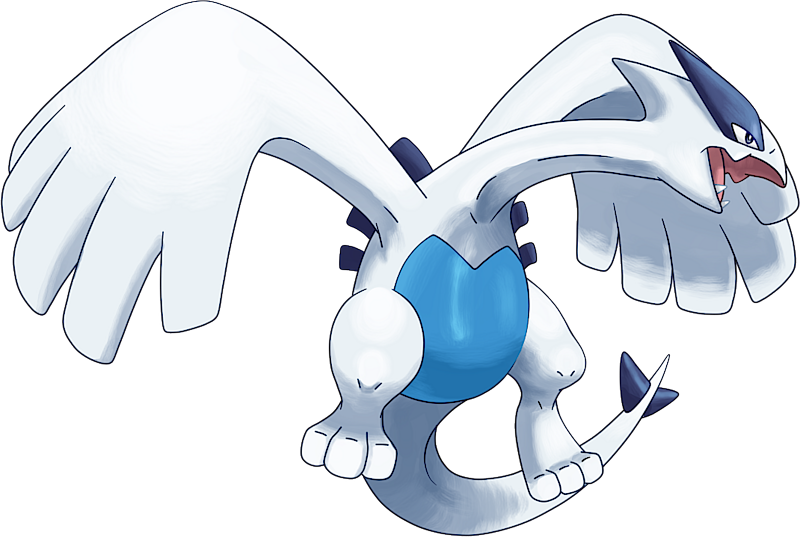 Its head has a point to the back, and Lugia’s eyes have pointed blue or black spikes on them. 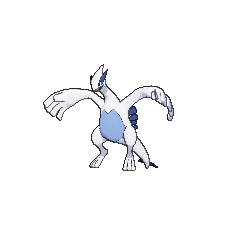 Lugia has a long, slender neck and a smooth, streamlined body. Dark blue or black plate-like protrusions run down the length of its back, and there are two smaller, more pointed ones on the end of its tail. It can fold back these plates to increase its speed. It has large wings that resemble hands. Though it is genderless, a young Lugia has been observed, suggesting that there is a breeding population. 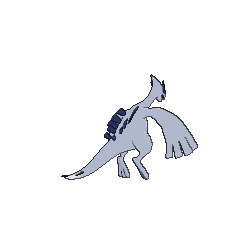 Lugia has been shown to be fiercely protective of its young. 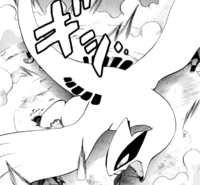 A Lugia was featured in The Power of One, central to the legend of Shamouti Island. Its psychic powers allow it to communicate with humans. A parent Lugia and its child (nicknamed Silver by Oliver) lived near Silver Rock Isle in the Whirl Islands. Dr. Namba attempted to capture both the parent Lugia and Silver for Giovanni in The Mystery is History, A Parent Trapped!. and A Promise is a Promise. The series pays mention of the Lugia that was seen in the Orange Islands, with both James and Ash stating that it was "like" the one they'd seen in the Orange Islands. In both versions, Ash first refers to the baby Lugia as a "mysterious Pokémon." A Lugia appeared in Hoopa and the Clash of Ages along with many other Legendary Pokémon. 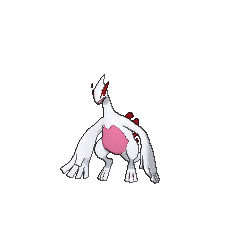 It is unknown if this Lugia is the same as the one that appeared in The Power of One, although it is unlikely, as this Lugia did not speak through telepathy. Lugia saved Ash, Misty and Brock from being sucked into a whirlpool in Around the Whirlpool. It later turned out to be the mother of Silver in The Mystery is History. A Lugia also appeared in a Team Rocket fantasy in An Egg Scramble!. Lugia made a brief cameo at the beginning of Jirachi: Wish Maker, Pokémon Ranger and the Temple of the Sea, The Rise of Darkrai, Giratina and the Sky Warrior, Arceus and the Jewel of Life and Zoroark: Master of Illusions. A wild Lugia appeared in The Adventure. 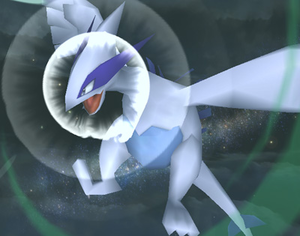 When released from a Poké Ball, Lugia will fly up out of the stage and return in the background, where it unleashes a powerful Aeroblast on the stage. Lugia is the only Legendary Pokémon to be part of Viz Media's Pokémon All-Stars DVD series. Lugia has been the mascot of three games, namely: Pokémon Silver, Pokémon XD: Gale of Darkness, and Pokémon SoulSilver, making it the record holder of most number of times used as a game mascot. Lugia is tied with Ho-Oh for the highest base Special Defense of all Flying types. 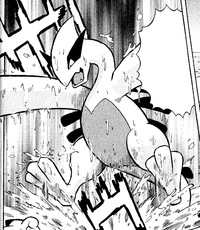 In the book adaptation of The Power of One, Lugia is mistakenly referred to as a Water/Flying type Pokémon. Lugia's tendency for being underwater resembles plesiosaurs. It is also possible that Lugia may be based on Ryūjin, a dragon who lived on the ocean floor and was the Shinto fake creature of the sea. 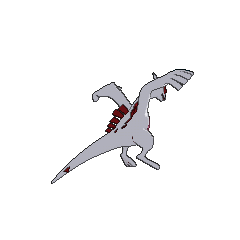 The two have similarities in mythology, and Lugia's Shiny colors (red and white) are the same colors as the coral Ryujin's palace was made of. Lugia's avian body, coloration and face-markings suggests that it may be somewhat based on the grey heron. The beluga whale, a white whale with a similar body shape and coloration to Lugia, may also be a basis for Lugia's design and name. Lugia's back fins and tail spikes are reminiscent of the Stegosaurus.